Polymorphism in pharmaceutical solids has great implications on both the processing and the performance of solid pharmaceutical products. It is the ability of a substance to exist in more than one molecular arrangement and the result is more than one polymorphic forms which differ in their physiochemical properties such as solubility, stability, melting point etc.1 Depending on these arrangements the polymorphic forms could vary in their relative stabilities; with the metastable forms eventually converting to the most stable form.1,2. Studying these phase transformations is important in understanding the properties of these polymorphic forms. Various techniques could be employed for this purpose but Differential Scanning Colorimetry is the most common and efficient technique as it allows following these transformations as a function of temperature or time, in addition to its high sensitivity.3 Nonetheless, sometimes it is difficult to build a clear picture of what is happening to the sample as it goes through a phase transition from just the heat flow signal provided by the DSC, and thus visualising these processes would be valuable. In addition, subtle transitions such as solid-solid transitions could be missed in the DSC if they happen over a wide temperature range. The Linkam DSC450 stage allows visualisation of the sample during a DSC experiment. Therefore, this system was used in studying flufenamic acid, one of the most polymorphic pharmaceuticals with a record of nine known polymorphic forms2. The aim was to study crystallisation from the amorphous phase obtained by melt quenching. 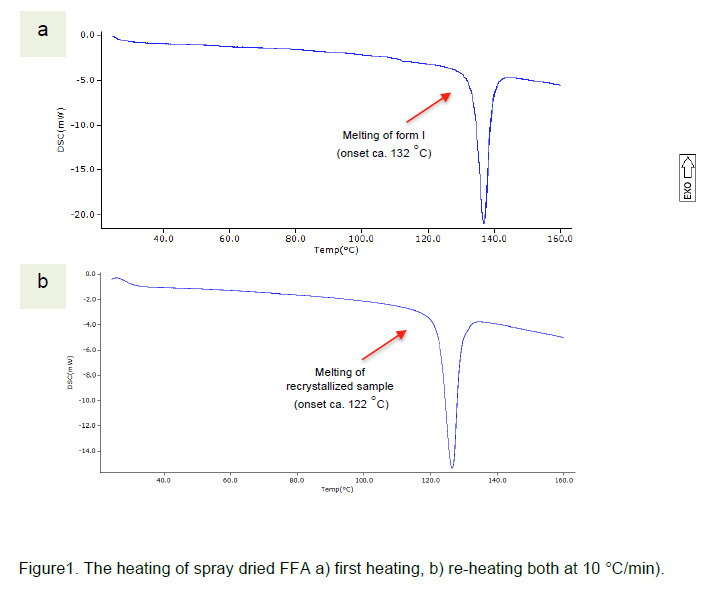 Form I was obtained by spray drying and was first heated in the DSC450 up to the melt, then it was allowed to cool down to room temperature before re-heating at a 10 °C/min heating rate. As shown in Figure 1, form I melted at ca. 132 °C while the re-heated sample melted at a lower temperature (onset of ca. 122 °C). No re-crystallisation was observed in the second heating cycle, which indicated that upon cooling a metastable form recrystallised from the melt. 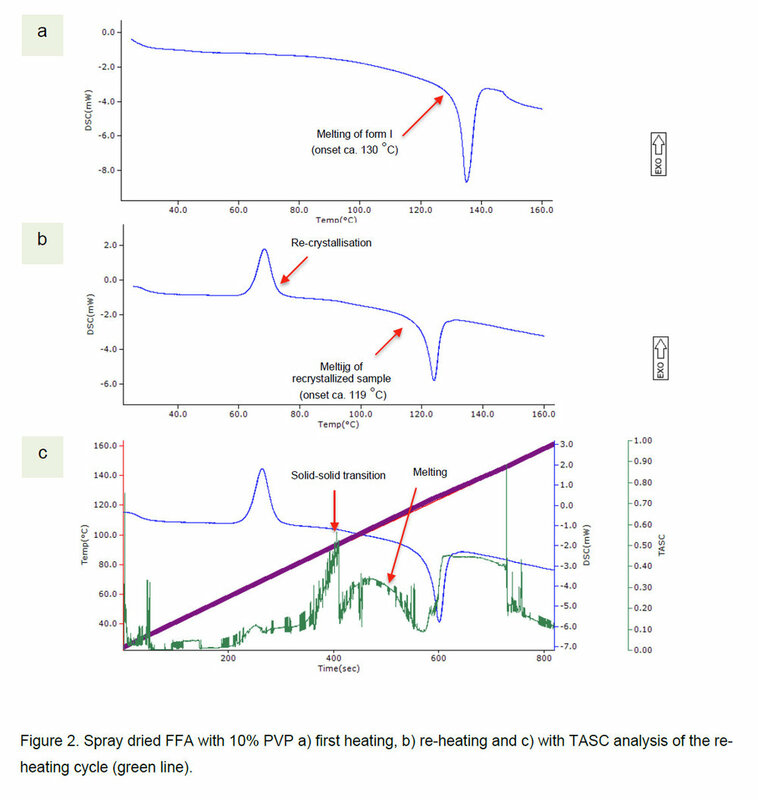 The effect of adding a polymer (PVP) is evident in Figure 2 where it appeared that the sample did not crystallise upon cooling but rather formed an amorphous phase. Heating the amorphous phase caused there-crystallisation of FFA followed by a solid-solid transition and then a melt. These events appear as two exothermic transitions followed by a sharp endotherm. The solid-solid transition is subtle in the DSC thermogram but is very clear from the signal obtained from employing an image analysis technique (Thermal Analysis by Surface Characterization, TASC) shown in Figure 2c. The melting peak has an onset temperature of ca. 119 °C, which is lower than that of the form crystallised from the melt without the presence of the polymer. The TASC signal also shows that melting is detected visually before the DSC signal starts to change. In this work polymorphic transitions in the pharmaceutical active flufenamic acid were studied with Linkam DSC450 stage, which combines optical microscopy with differential scanning calorimetry. The power of the complementary technique was evident with the increased sensitivity for detecting subtle transitions such as solid-solid transition by analysing the optical images. 1. Rodrı́g uez-Spong, B., Price, C. P., Jayasankar, A., Matzger, A. J. and Rodrı́guez-Hornedo, N. r. 2004. General principles of pharmaceutical solid polymorphism: A supramolecular perspective. Advanced Drug Delivery Reviews 56(3): 241-274. 2. López-Mejías, V., Kampf, J. W. and Matzger, A. J. 2012. Nonamorphism in flufenamic acid and a new record for a polymorphic compound with solved structures. Journal of the American Chemical Society 134(24): 9872-9875. 3. Gaisford, S. and Saunders, M. 2012. Physical form i – crystalline materials. Essentials of pharmaceutical preformulation, John Wiley & Sons, Ltd: 127-155.